#NDA rules apply. Maybe Calvinball rules too. Everything’s after the jump so people who to know nothing are preserved, and you should probably watch the trailer yourself first. 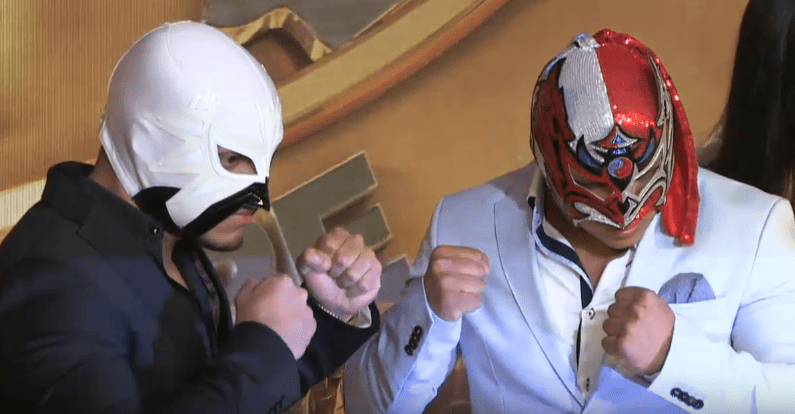 CMLL held a press conference today to announce the card for their 83rd Anniversario show. 2) Ephesto, Mephisto, Shocker vs Marco Corleone, Máximo, Stuka Jr.
Tickets go on sale tomorrow. As of now, there’s no price listing on Ticketmaster. The trios match is the only big addition we did not previous, and should be a stellar match. The overall card is not at the star power of recent years. It was going to be impossible without another Atlantis mask match, but this is much close to the level of the Terrible/Rush main event prior to it, and arguably less than that. The Anniversary show will NOT be transmitted live via PPV, but instead be put up on demand the next day on YouTube. The plan is for it to be up Saturday at 8AM. No price was announced. That’s not nearly as fun and ruins the community aspect of watching a show, but at least it should go up complete. It does indicate CMLL considers the Sunday VOD show successful if they’re trying it again. This show not being as big a deal as years past takes away the sting – the results are obvious or unimportant, I’m more interested in how they get there – but it does stink not having an official live option. People are just going to end up watching iffy Periscope streams instead. It does appear this will not be the only major show in September. JCR ended the press conference by mentioning other surprises and festivities planned for the month, and announced a September 7th press conference to discuss those. That happens to be the same day as the Lucha Underground Season 3 debut; their trailer also dropped today. CMLL announced a photo exhibit at Liverpool stores from 08/25 to 09/23. 5) Kráneo, Niebla Roja, Ripper b Johnny Idol, Rey Cometa, Star Jr. I usually wait for the full results to be posted from Guadalajara, but worth noting the two finishes in the main event. No sign of an angle for Caristico/Mephisto, and Dragon Lee and La Mascara continue to feud. This is also another good turnout for Guadalajara, thanks to some combination of Caristico and summer holidays. Dragon Rojo Jr. & Polvora will help train police in self defense in Mexico City. 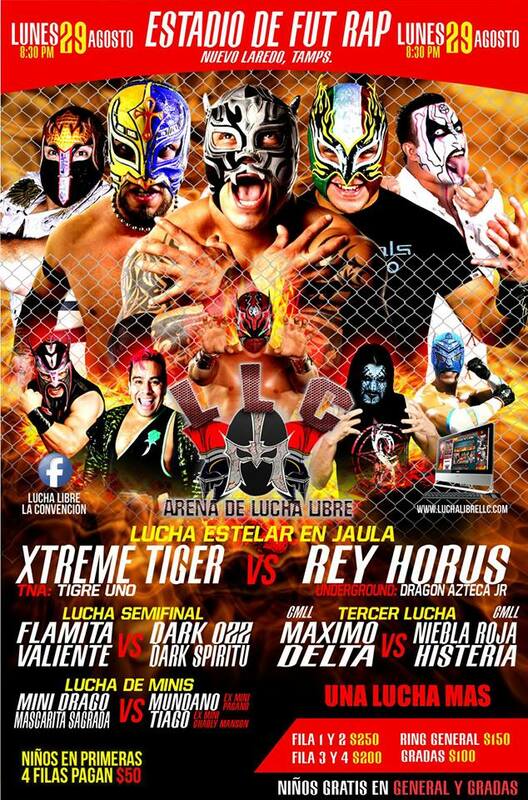 LLC 08/29 in Nuevo Laredo has Rey Horus vs Extreme Tiger on top, plus Valiente & Flamita vs Ozz & Espiritu. Ozz had quit AAA and stopped wrestling outside of his hometown back around 2014, but has turned up a couple times in the last couple months, including last weekend in Texas for Martinez promotion. Apolo Valdes writes about the many valueless championships in Mexico. Cross Arm Breaker writes about La Fiera vs Babe Face. Rush being on Tuesdays suggests he won’t be on Fridays and such won’t be added to the Anniversary main event, but we should know all we need to know on that. It does leave for a pretty good main event for a Tuesday. Niebla, Shocker & Terrible against Angel de Oro, Johnny Idol and Titan to CMLL really needing another group of semimain rudos who are good against high flyers. This might be the last show for the guys going to the Super J final; they could pop up on the Elite show on Thursday but likely would be have to leave before Friday’s show. Fantasy winning the cibernetico is pretty unexpected. He doesn’t seem to stand much of a chance. Niebla Roja is listed on both shows. Super Porky is listed at all is just as unlikely.